Os grid reference: SJ 0241 2654. In the valley of the river Tanat, at the foot of the Berwyn mountains, northern Powys, is the lonely and remote hamlet of Pennant Melangell and St Melangell’s Church, which is dedicated to a 7th or 8th century Welsh princess called Melangell or Monacella, patron saint of hares and rabbits. The partly Norman church houses the 12th century shrine of St Melangell as well as her grave; also in the church are two 15th century wood-carvings depicting the saint’s legendary life, two medieval stone effigies, and a Norman font. The church at Pennant, its original name being Llanmelangell-yn-Pennant, has been a place of devout pilgrimage since at least the 10th century. About a quarter of a mile to the south of the remote hamlet amongst an outcrop of rocks is the saint’s so-called stone bed (Gwely Melangell). The hamlet of Pennant Melangell lies just off the B4391, whilst the town of Bala is 8 miles to the north-west, the village of Llangynog is 2 miles to the east, and Lake Vyrnwy 4 miles due south. According to legend, Melangell was the daughter of King Cyfwlch Addwyn – the very same Cyfwlch who is mentioned in the ‘Tales of Culhwch & Olwen’ as being a member of King Arthur’s court; he was also said to have been related to St Helen of Caernarvon, the famous Helen Llwddog (Helen of the Legions) who married the Roman general, Magnus Maximus (Macsen Wledig), although a few have considered her to be of Irish birth, and perhaps the daughter of a King Jowchell? Melangell fled from her father’s court to avoid marrying an unsuitable partner, wishing instead to seek a life of prayer and devotion to God. She came upon the wooded valley of the Tanat (c590 AD), finding it much to her liking; indeed she lived in a cave at Gwely Melangell to the south of the present-day hamlet that bears her name. Here in an outcrop of rocks the saint’s so-called stone bed is to be found, although the stone is probably a natural-rock feature. Soon local people got to know of Melangell and came to see her, some women even left their babies for her to nurse; to Melangell all wild creatures were very dear to her, even the trees and flowers gave her great pleasure. But the best part of ‘The Legend’ says that one day a local prince Brochfael Ysgthrog of Pengwern came hunting in the valley, and when one of his hounds gave chase to a hare it ran for protection beneath St Melangell’s robe. When the prince came upon this sight he was literally ‘stopped in his tracks’ at the very sight of such a radiant young woman, his hounds refusing to kill the hare. Prince Brochfael, having inquired as to her name (she informed him it was Melangell), then asked her to marry him, but she told the prince that that was not possible because ‘she only wanted to live her life for Christ in peaceful Pennant’. Prince Brochfael was not really surprised at her answer, so instead he gave her some land at Pennant on which to build a nunnery for local women (c604); the present-day church presumably stands on the site of that building. St Melangell’s Shrine at Pennant Melangell Church. In the early part of the 7th century St Melangell died and she was buried in the church, or chapel, one of two that had stood here prior to the present-day building, which stands in a circular churchyard, a feature that means it is a sacred site and possibly a Bronze-Age settlement? The yew trees are thought to date back 2,000 years, and some of the foundation stones of the church may date back to 800 AD. 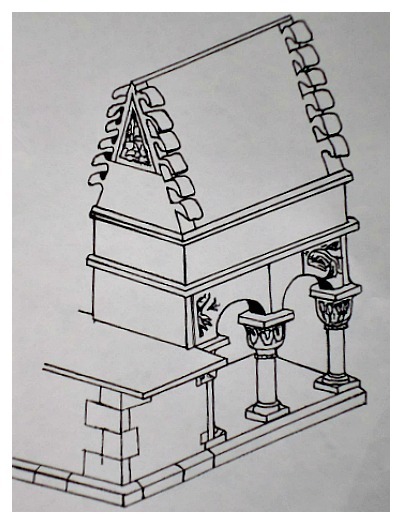 Today the building houses The Melangell Centre, but in the chancel stands the shrine of St Melangell, dating from 1170, a Romanesque structure that was beautifully restored in 1958 and, which originally stood at the east side of the church in the Cell-y-Bedd (Cell of the Grave) where the saint was ‘said’ to have been buried. A stone slab believed to have once marked the saint’s grave is now built into the apse floor. Here at this remarkable stone structure pilgrims sought a miraculous cure, offering their prayers and votive messages to St Melangell, which continues today in one form or another. On the restored oak loft-screen are two 15th century wood carvings which are part of a frieze that depict ‘the legend’ of Melangell and Prince Brochfael, and in the chancel two 14th century stone effigies, one of which is Melangell with a hare at her side, while the other is of Prince Madoc ap Iorwerth Drwynden, son of Owain Gwynedd, king of north Wales. Madoc was treacherously murdered at Bwlchgroes by his own brother’s followers so that his brother, Dafydd, could ascend to the throne of Powys before his time. The carved 15th century rood-screen, now also restored, is a delight as is the 12th century Norman font. Barber, Chris., More Mysterious Wales, Paladin, London W1X, 1987. Jones, Andrew., Every Pilgrim’s Guide To Celtic Britain And Ireland, The Canterbury Press, Norwich, Norfolk, 2002. 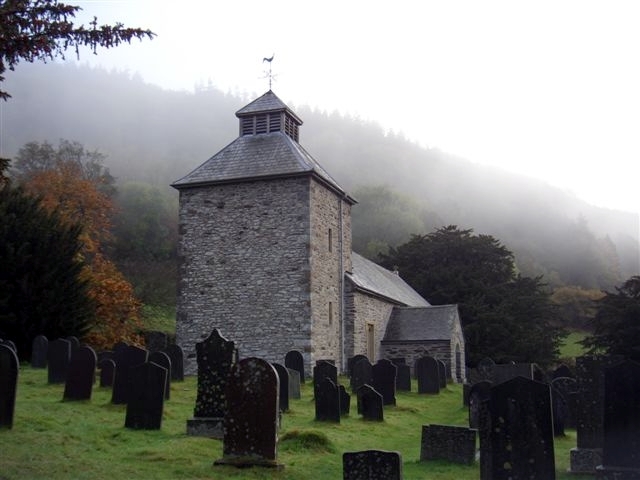 Categories: Ancient Churches / Chapels | Tags: St Melangell's Church at Pennant Melangell in Powys | Permalink.